How to watch The Cabin in the Woods (2012) on Netflix Russia! Sorry, The Cabin in the Woods is not available on Russian Netflix, but you can unlock it right now in Russia and start watching! With a few simple steps you can change your Netflix region to a country like Spain and start watching Spanish Netflix, which includes The Cabin in the Woods. We'll keep checking Netflix Russia for The Cabin in the Woods, and this page will be updated with any changes. The Cabin in the Woods is not available in Russia BUT it can be unlocked and viewed! Five friends arrive at a secluded cabin with clear rules for their retreat. But when protocol is broken, punishment is swift -- and everyone will pay. You know the drill: Walking clichés get slaughtered one by one. But here's the thing. This ... isn't that. 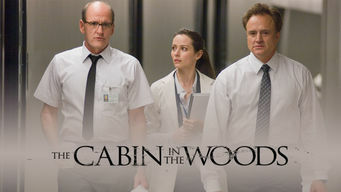 There is a way to watch The Cabin in the Woods in Russia, even though it isn't currently available on Netflix locally. What you need is a system that lets you change your Netflix country. With a few simple steps you can be watching The Cabin in the Woods and thousands of other titles! Watch "The Cabin in the Woods"